Short answer: By mass, no, the less massive body will orbit the more massive body and stars are generally much more massive than planets. By volume, it’s possible for the planet to be larger than the star. Longer answer: Gravity is cool in that every piece of matter in the universe is attracted to every other piece of matter in the universe. There’s a neat symmetry to this, meaning that even though the sun is pulling on the earth, the earth is also pulling on the sun. This is called the two-body problem in Newtonian gravity, and you can actually solve the equations to tell you exactly how the orbits work. If one body is much much more massive than the other, then it will basically remain stationary at the center of the system while the less massive member orbits. So the masses determine the orbits, and stars are pretty much always going to be more massive than their planetary systems. The smallest known stars can be as little as 1-10% the mass of the sun, and largest known planet is about 2-3% the mass of the sun, and this is due to there being a sort of grey area between planets and stars which is determined by things like their composition and formation history. If you wanted to, you might be able to pair a large, cold planet with a star right at the lower limit for being capable of fusion, but that system would be similar to those equal mass orbits I showed above, so this would be more aptly characterized as a binary than what you typically consider an orbit. But if we compare the planet and star by radius we’ll find it’s a different ball game entirely. Stellar remnants like neutron stars and white dwarfs can get really small. A solar mass white dwarf can be the size of the earth if it is made of the right stuff has been given sufficient time to cool. 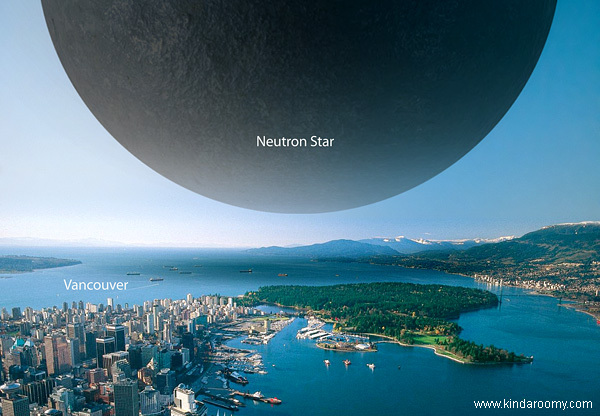 A solar mass neutron star, on the other hand, can be the size of a city because they are basically pure nuclear matter with no electrons in between. They are so dense that all of humanity, all 7 billion of us, would be crushed into the volume of a sugar cube if we were dropped on a neutron star. As a matter of fact, when the sun exhausts its useable fuel in about 5 billion years it will contract to form a white dwarf about the size of the earth. So while the sun will continue to be the dominant gravitational piece of the solar system, and while it may be 1000x bigger than Jupiter now, it will some day shrink down to a ball small enough to fit in Jupiter’s red spot.